I love to see animals Walt Disney style. You get a sense of action, adventure with a rainbow sprinkle of danger, with the added benefit of knowing that you are completely safe. I felt safer seeing lions and cheetas at Disneyworld than I did in the henhouse on my trip to the egg farm. I felt safer seeing hippos and rhinos at Disneyworld than I did on their Mount Everest roller coaster. (Backwards in the dark...bah!) Why do I keep going on roller coasters? I hate them. But I love to hate them. I asked my niece Bella if she liked riding on Mount Everest. She said, with all of her five year old wisdom, "I hate it and I love it." I couldn't have said it better myself. But let's get back to the animals, OK? This is a cool high school giraffe hanging out with a junior high buddy. Here's the jungle equivalent of a show off. We went on the safari expedition twice and he tried to race us both times. Excuse me, ma'am. I believe you dropped something. I was bemoaning the fact that we didn't get to see a rhino close up, when this guy showed up and wouldn't move and we had to watch him for twenty minutes. This baby gorilla is adorable. I wanted to put him in my pocket and take him home and feed him jars of banana baby food. I'm not sure how his mother would feel about it. Look at George and Martha in the bathtub. When you are done poking fun at animals, you head over here and eat a few. Doesn't that sound cruel? There's something disturbing about eating meat at a zoo, but don't let that stop you. Truth be told, I got a fruit plate and a half order of onion rings. I'm not man enough to eat meat in the zoo. The Quiet man wasn't as easily daunted and ordered the ribs and I stole a small bite. Deelish. I didn't take a picture, not because I forgot but because we were busy fending off a gang of scavenging birds while we gobbled down our lunch. I tell you, it's a jungle out there. 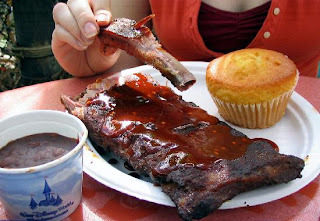 This picture is stolen shamelessly from a travel review site. I doubt they'll mind. Just wanted you to know that I wasn't posting my cleavage with the ribs. I had to get the recipe for the barbecue sauce so that I could make it for the Quiet Man for Father's Day. Apparently they field daily requests for their sauce, so here it is. Give it a try on chicken, pork, or even dunk your onion rings in it. See you next time with some treats from Hollywood Studios. Notes: Might as well double it and freeze some for next time. In a medium saucepan, combine all ingredients. Bring the mixture to a boil, reduce heat and simmer for about 35 minutes. Store in the fridge for up to two weeks. Haha you made me lol at that picture! That's a crack up about watching the animals and then eating the animals. So true, too. The barbecue sauce looks delicious and it's sounds even better with some onion rings. In fact that sounds like the perfect for snack for Saturday night while the men are away at conference. I remember going through a safari like that, it was so much fun. I bet your kiddos loved it. The BBQ sauce sounds great. I wouldn't have thought to add tumeric and cumin: yum! yum! yum! I love that you're doing Disneyworld recipes! We are trying to get there this year. worked...I drove on the highway with my windows down in nice hot humid weather and it is still as perfect as when I straightened it 2 days ago!! Buy this product it is worth the money!!! hair next(even if u wait 3 days).. Please buy this product if u don't believe me. Howdy! You some kind of professional? Great message. Are you able to inform me find out how to subscribe your blog? Stay up the good work! You realize, lots of persons are looking round for this information, you could help them greatly. 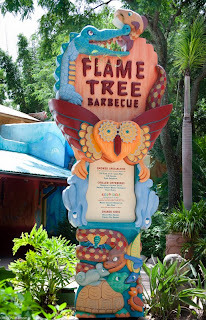 I rarely drop responses, however i did a few searching and wound up here "Flame Tree Barbecue Sauce and Wild Animal Kingdom". me or does it look as if like a few of the remarks come across like they are coming from brain dead people? :-P And, if you are writing on additional places, I'd like to follow everything new you have to post. Would you list of all of all your shared sites like your Facebook page, twitter feed, or linkedin profile? Thanks for any other informative blog. Where else may I get that type of information written in such a perfect method? I've a undertaking that I'm just now running on, and I've been at the look out for such information. as exactly the same nearly a lot often inside case you shield this increase. Hi my friend! I want to say that this article is awesome, great written and include approximately all significant infos. If you would like to improve your knowledge just keep visiting this web page and be updated with the latest gossip posted here. are talking approximately! Bookmarked. Kindly also talk over with my site =). get in fact loved account your blog posts. Any way I'll be subscribing for your feeds or even I success you get right of entry to consistently rapidly. Any way I will be subscribing in your feeds or even I success you get entry to consistently quickly. You have performed an impressive process and our entire community will be grateful to you. I'm sending it to some friends ans also sharing in delicious. And naturally, thanks on your effort! What's up, this weekend is fastidious for me, as this occasion i am reading this impressive educational piece of writing here at my house. Here is my weblog; Cost-free Software package Downloads available in addition to Testimonials -- Soft-Downloads. my blog post Cost-free Software Downloads available along with Opinions - Soft-Downloads.